Japanese nuclear inspectors have identified a new radioactive leak at a power plant that was badly damaged in this week's earthquake, compounding concerns about the safety of the country's nuclear reactors. The Nuclear and Industrial Safety Agency said radioactive iodine had leaked from an exhaust pipe at the Kashiwazaki-Kariwa plant in Niigata prefecture on Japan's north-west coast following Monday's magnitude 6.8 earthquake in which 10 people died. The inspectors concluded that the leak posed no threat to human health or the environment, although that claim has yet to be confirmed by agency officials. The plant - the world's largest nuclear generating facility by capacity - will remain closed until its safety can be assured. The Nikkei business newspaper said today that it could remain inactive for at least a year, increasing the likelihood of power cuts when demand for electricity peaks this summer and casting doubt on plans to expand the nuclear power industry. Reports of the additional leak come after the plant's operator, the Tokyo Electric Power company (Tepco), said 1,200 litres of water containing a small amount of radioactivity had leaked into the sea and dozens of barrels containing low-level nuclear waste had broken open during the quake. The firm was heavily criticised for failing to quickly extinguish a fire that broke out in an electric transformer at the plant and for delays in reporting malfunctions to the authorities. Yesterday it emerged that the plant may have been built on top of the fault line that caused the earthquake. Japan's nuclear safety commission said the malfunctions caused by the quake had not threatened the safety of the plant's seven nuclear reactors. "The safety of the plant was fundamentally maintained and we avoided the serious consequences of a nuclear accident," the commission's chairman, Atsuyuki Suzuki, said in a statement. "The list of problems announced by Tepco has no serious effect on the safety of the reactor." 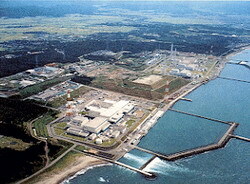 Yasuhisa Shiozaki, the government's top spokesman, urged all of the country's nuclear plants to speed up safety checks. "Since there was such a huge earthquake that surpassed our expectations, we need to consider future measures for quake resistance," he said. Japan depends on 55 nuclear reactors for 30% of its electricty and hopes to build more in the coming years. Other companies were left counting the costs of the earthquake, which injured more than 1,000 people and left 12,000 others homeless. Toyota, Nissan, Honda, Mitsubishi and Fuji Heavy Industries have all been forced to halt production in the area due to quake damage.